Hainan authorities have come under fire once again after a recent report found scuba diving tour operators duping tourists into paying more during the recent Spring Festival holiday. Last year, similar allegations had immersed the province’s main city, Sanya, in scandal and tainted the island’s reputation as a sun-and-sea getaway for domestic and foreign tourists. The report, which ran on CCTV on Saturday, said scuba tour operators and travel agencies were raking in sales commissions as high as 50 per cent to 80 per cent and were able to do so by forcing tourists to take “underwater photographs”. The diving packages, priced at 400 yuan to 500 yuan, would usually include “some photos”, but some tour operators would often make visitors pay more for separate photo packages that were all priced differently. The packages could cost between 360 yuan (HK$450) for three photos and 780 yuan (HK$970) for 24 photos, according to the CCTV report. Those who refused to pay for separate photo packages were often taken into the water “abruptly” without being taught how to equalise pressure when changing depths, the report said. “Without learning how to release the pressure every few metres, the tourist would get decompression sickness quickly and request to go back up within just a few minutes,” tour guide Wu Jingmin told CCTV. Sanya officials last year vowed to punish any tour guides, travel agents and tour operators engaged in price gouging over the holidays after tourists complained of being “irrationally” overcharged. The island is a popular destination for domestic tourists looking to escape the winter cold that often accompanies the Lunar New Year. 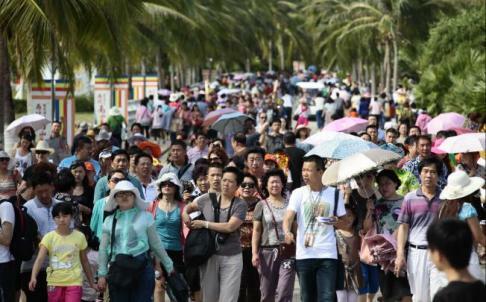 About 500,000 tourists visited Sanya during the week-long holiday last year. Beijing has recently announced plans to inject 350 billion yuan to turn Hainan into a top international tourist destination by 2020. This includes the possible development of a gambling and tax-free luxury goods shopping hub.